For opera lovers, the big news is the recent opening of Donizetti's Maria Stuarda, the first fully stage production of this work in Canada. It is showing at the Four Seasons Centre. Its stellar cast is headed by Italian soprano Serena Farnocchia, whose limpid tones are always a pleasure. The exciting Bulgarian soprano Alexandrina Pendatchanska sings Elisabetta, and American tenor Eric Cutler is Leicester. There is only a single performance this week (tomorrow May 4 at 7:30 pm) as the opera house is needed for the soon-to-open Idomeneo. I will see the Donizetti tomorrow and will have more to report. 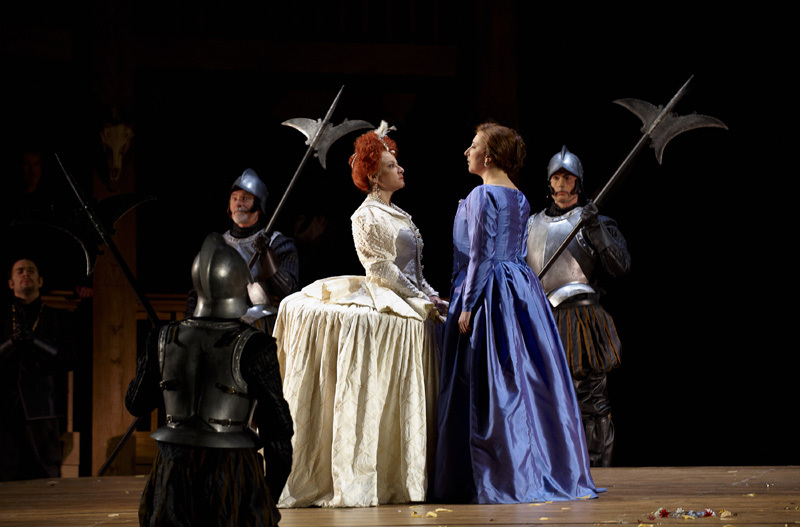 On Sunday 2 pm, Mozart's Idomeneo takes centerstage at the Four Seasons Centre. It stars American Mozart specialist Paul Groves in the title role. This will be Groves' COC debut. Soprano Isabel Bayrakdarian sings Ilia, a role she sang earlier in the season at the Paris Opera. American soprano Tamara Wilson returns as Elettra. Canadian mezzo Krisztina Szabo is Idamante, a role sometimes sung by a tenor. Canadian tenor Michael Colvin (Arbarce) returns after an absence. He has centered his career in the UK the last two years. Colvin will also sing the title role in an all-Ensemble show on May 19. The music of Idomeneo is simply glorious - any chance to hear "Fuor del Mar", especially the difficult version, is not to be missed. Meanwhile I attended the Sunday matinee of Der fliegende Hollander, and it proved to be a memorable afternoon at the opera. For me, the production by Christopher Alden and Allen Moyer remains problematic. Yes I do feel the German Expressionist style in this production is a good choice, but the way it is executed is more open to debate. Its rather claustrophobic-looking unit set poses serious limitations to scene changes, making it confusing for audience members new to this piece. For example, no phantom ship is physically possible in this production. Obviously we are in the 21st century and one shouldn't be slavish in adhering to operatic convention, but judging by the various subtexts and some radical stage directions introduced by Alden, his concept has strayed far from the original. OK, nobody expects Senta and Dutchman ascending to heaven - this original staging, rather hokey by modern day standards, I actually saw in Sarasota some years ago. But having Erik shoot Senta changes things considerably! The wandering Jew subtext and the "outsider" idea is so overused in European Regietheater these days that these twists no longer appear fresh. Thankfully the musical side of things was great. The orchestra was fantastic, with Johannes Debus giving a well-paced, incisive reading of great clarity and eloquence, eliciting torrents of exciting yet totally refined sounds from the pit. The fabulous chorus outdid itself, and the soloists were uniformly excellent. Particularly impressive was Evgeny Nikitin, whose singing surpassed the two previous Dutchmans in this production. The same can be said about Julie Makerov's Senta. Her voice, powerful yet lyrical, is perfect in the Jugendlich dramatisch repertoire. She would make an excellent Elsa and Elisabeth in the future. Swiss tenor Robert Kunzli, in the ungrateful role of Erik, sang his two arias with clarion tone. Mats Almgren was challenged by the low notes in the beginning, but warmed up to give an estimable performance, his unique bass with its dark and menacing timbre ideal as Daland. Finally I want to single out tenor Adam Luther, whose Steuermann was the best work he's done for the COC. This character doesn't have much music to sing, but he is unusually involved in this production, and Luther is up to the challenge. This show is well worth seeing (Saturday 4:30 pm). The COC Ensemble Studio will give a Spring Schubertiade at the Richard Bradshaw Amphitheatre at noon on Tuesday. Soloists include Erin Fisher, Michael Uloth, Wallis Giunta, Michael Barrett, Simone Osborne, Teiya Kasahara, Laura Albino, Adrian Kramer, Neil Craighead, Adam Luther, and Ileana Montalbetti, this last singer tackling the highly dramatic Der Erlkonig! Anne Larlee is the pianist. The full program can be downloaded as a pdf file at http://coc.ca/ecms.ashx/pdfs/concert100504.pdf Remember to show up 45 minutes ahead of time for a seat.